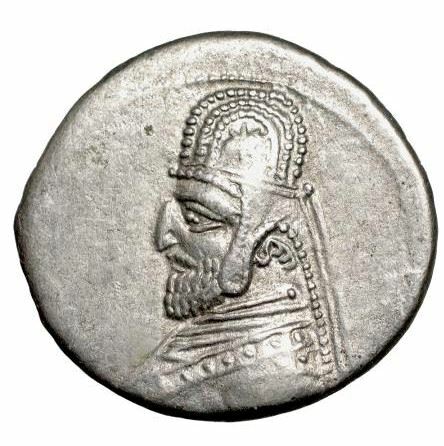 Mithradates III was king of Parthian Empire from 57–54 BC. Mithridates was a son of Phraates III, whom he murdered in 57 BC, with the assistance of his brother Orodes. Orodes became king of Parthia and made Mithridates king of Media, a Parthian client state. On account of his cruelty, Orodes turned on his brother and deposed him. Mithridates was forced to flee from Media to Roman Syria. He took refuge with Aulus Gabinius, the Roman proconsul and governor of Syria. Mithridates then returned to invade Parthia with Gabinius in support. He advanced into Mesopotamia and managed to conquer Babylonia. He ousted Orodes and briefly restored his reign as king in 55 BC, minting coins in Seleucia until 54 BC. However, king Mithridates was besieged by Orodes' general, Surena, in Seleucia, and after a prolonged resistance, offered battle to Orodes' forces and was defeated. Mithridates was taken prisoner and executed in 54 BC.